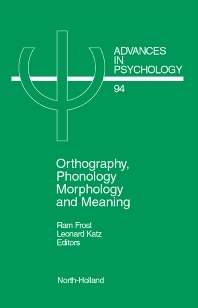 Orthography, Phonology, Morphology, and Meaning: An Overview (L. Katz, R. Frost). Part 1: Language and Orthography. Linguistic Awareness and Orthographic Form (I.G. Mattingly). Reading Consonants and Guessing Vowels: Visual Word Recognition in Hebrew Orthography (R. Frost, S. Bentin). Basic Processes in Reading: Is the Orthographic Depth Hypothesis Sinking? (D. Besner, M. Chapnik Smith). The Reading Process is Different for Different Orthographies: The Orthographic Depth Hypothesis (L. Katz, R. Frost). Beyond Orthographic Depth in Reading: Equitable Division of Labor (M.S. Seidenberg). Automatic Activation of Linguistic Information in Chinese Character Recognition (D.L. Hung, O.J.L. Tzeng, A.K.Y. Tzeng). Orthographic Neighborhoods and Visual Word Recognition (J. Grainger). On the Role of Cohorts or Neighbors in Visual Word Recognition (N.F. Johnson). Part 2: Orthography and Phonology. The Relation of Speech to Reading and Writing (A.M. Liberman). On the Relations between Learning to Spell and Learning to Read (D. Shankweiler, E. Lundquist). Phonological Awareness, Reading, and Reading Acquisition: A Survey and Appraisal of Current Knowledge (S. Bentin). Can Theories of Word Recognition Remain Stubbornly Nonphonological? (C. Carello, M.T. Turvey, G. Lukatela). Reading in English and Chinese: Evidence for a Universal Phonological Principle (C.A. Perfetti, S. Zhang, I. Berent). Assembled Phonology and Reading: A Case Study in How Theoretical Perspective Shapes Empirical Investigation (G.C. Van Orden, G.O. Stone, K.L. Garlington, L.R. Markson, G.S. Pinnt, C.M. Simonfy, T. Brichetto). Dual-route Models of Print to Sound: Red Herrings and Real Horses (K.R. Paap, R.W. Noel, L.S. Johansen). Strategies and Stress Assignment: Evidence from a Shallow Orthography (L. Colombo, P. Tabossi). Part 3: Orthography and Lexical Structure. Morphological Analysis in Word Recognition (L.B. Feldman, D. Andjelkovi&cacute;). Units of Representation for Derived Words in the Lexicon (C. Burani, A. Laudanna). Representation and Procesing of Morphological Information (C. Beauvillain, J. Segui). Bilingual Lexical Representation: A Closer Look at Conceptual Representations (A.M.B. de Groot). Memory-addressing Mechanisms and Lexical Access (K. Forster). The area of research on printed word recognition has been one of the most active in the field of experimental psychology for well over a decade. However, notwithstanding the energetic research effort and despite the fact that there are many points of consensus, major controversies still exist. This volume is particularly concerned with the putative relationship between language and reading. It explores the ways by which orthography, phonology, morphology and meaning are interrelated in the reading process. Included are theoretical discussions as well as reviews of experimental evidence by leading researchers in the area of experimental reading studies. The book takes as its primary issue the question of the degree to which basic processes in reading reflect the structural characteristics of language such as phonology and morphology. It discusses how those characteristics can shape a language's orthography and affect the process of reading from word recognition to comprehension. Contributed by specialists, the broad-ranging mix of articles and papers not only gives a picture of current theory and data but a view of the directions in which this research area is vigorously moving.